The Cube is stunning. It is one of the world’s largest digital interactive learning and display spaces and is at the heart of a spanking new $230 million science and engineering centre. There is a sky-high virtual reef so beautiful and lifelike you want to jump in and swim with the fishes. 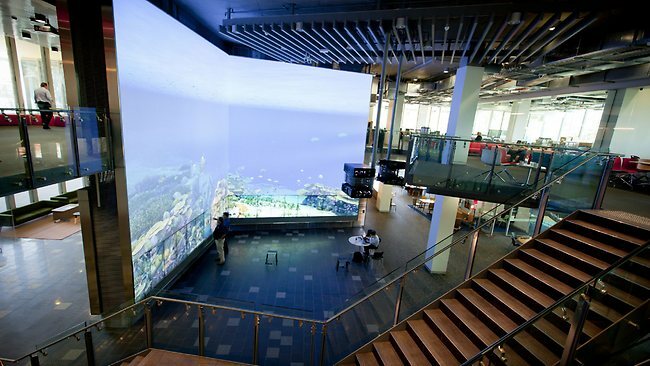 The two-story-high virtual reef is a stunning addition to The Cube building at QUT. The interactive underwater world is two storeys high. Touch-screen and new sound technology allows visitors to get information on fish species, corals and other marine life. The Cube it is out of this world, especially the wall where citizen scientists can explore the planets. Right now there is also a community science exhibit known as the Flood Wall, a virtual and interactive storytelling of the 2011 Brisbane floods. 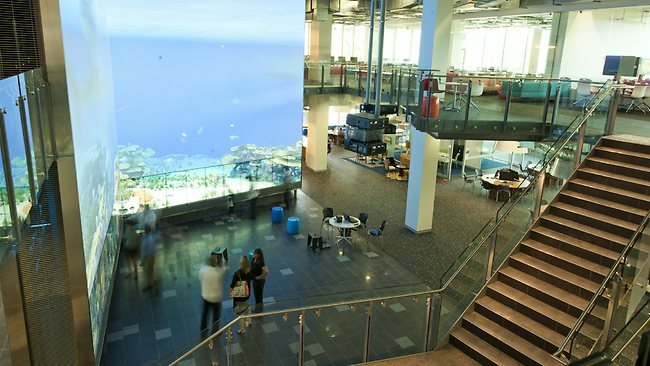 A two-story-high virtual reef inside The Cube at QUT is likely to become a tourist attraction. The Flood Wall shows how high water levels reached across the city. Touch-screen technology allows you to move across the map and see how events unfolded, how the city and residents were affected and how the gallant Mud Army rose to the challenge to help get Brisbane back on its feet. Anyone can play – and learn. Coaldrake is bristling with pride. The old barriers between academia and schoolchildren have been torn down. “Part science lab and part digital engagement, The Cube will be the hub of scientific exploration for high-school students, the QUT community and the wider public,” Coaldrake says. 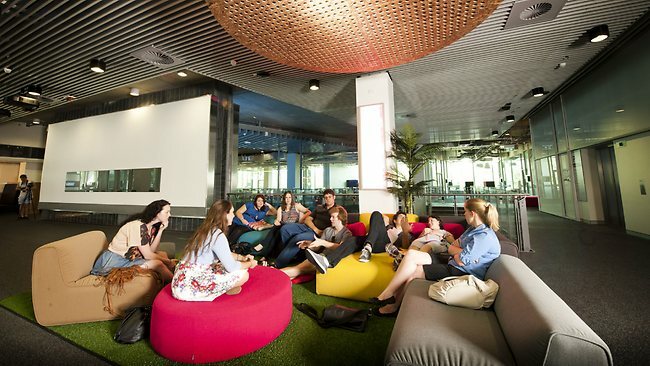 Students relax in spaces that look more like international hotels than a university. He has nursed the project through tough times since announcing it in 2008. He says the interactive displays back up research projects at the university. “The Cube will inspire and engage the next generation of thinkers and doers with an extensive outreach to schools, including hands-on and interactive workshops and public programs for high-school students and QUT undergraduate and postgraduate students,” Coaldrake says. The Science and Engineering Centre has reshaped the QUT campus and sits comfortably with Old Government House, now the William Robinson Gallery. The John Kindler theatre in The Cube at QUT. The new building is for students of science, technology, engineering and mathematics. 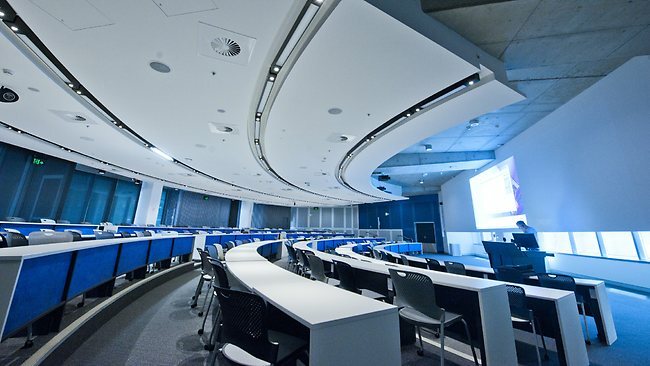 They learn in attractive spaces that look more like an international hotel than a university. Coaldrake says the SEC is also home to QUT’s new Institute for Future Environments with researchers from computing, mathematics, environmental and geosciences, robotics and engineering. He speaks of “cross-disciplinary research”. Several QUT buildings have been or will be demolished as the university reinvents itself. There is a new underground pool and gym and a new food and retail precinct. And there will be a user-friendly pedestrian link from Goodwill Bridge to the Brisbane Botanic Gardens. The architecture is adventurous, highly refined and sophisticated.